I’ve been competing in Navigational road rallying for over 30 years and it’s been one of my absolute most favorite pastimes. When I sayNavigational rallies, often called TSD (Time, Speed, Distance) rallies in the United States, people often confuse this with Performance rallying as seen in the WRC series. Not the same thing! Navigational rallying is done on public roads and therefore competitors have to obey all of the applicable traffic laws. It isn’t so much a race as it is a precision driving event. The three golden rules are: stay on the road, stay on the correct route and stay precisely on schedule. Where it becomes most interesting for me is in northern climates such as where I live in Quebec. In winter we run these types of events far out in the countryside and at night. 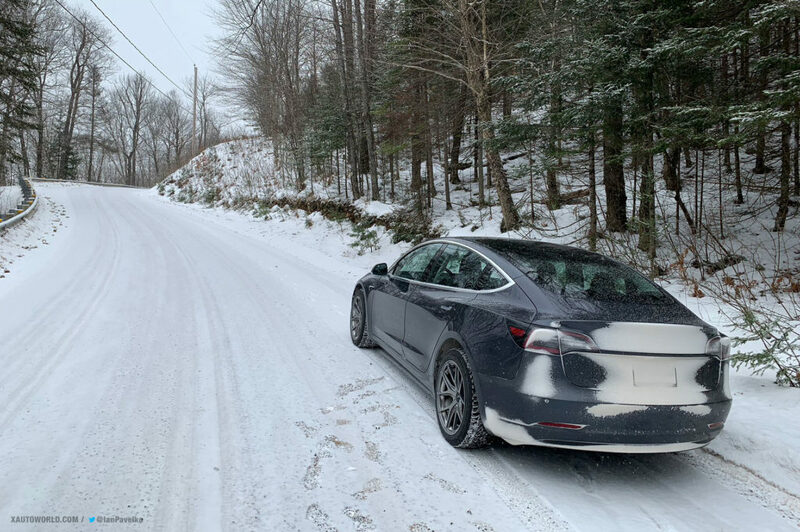 This means we get to use beautiful winding, snowy rural roads with virtually no traffic. Although I said that navigational rallying is not a race, because of these roads have 70 or 80 km/h speed limits trying to maintain that as an average on snow and ice at sub-zero temperatures and in the dark can be very challenging. Not every driver or car is up to it, it’s an excellent test of both. Cars have literally been the driving force in my life since I was tall enough to look out the window and name the different models as they drove by. As Director of Technical Services for Fast Wheels, they also are my livelihood. But over time it was becoming apparent to me that both my all-consuming passion and career were at odds with our planet’s future, and no one in the industry was really doing anything serious about making an affordable, sustainable car that an enthusiast could love. You might then well imagine how excited I was when the Tesla Model 3 was announced; not only was this the first EV that fit the profile of exactly what I wanted — a high-performance AWD sport sedan at an attainable price point – but it was also the first that I thought might have what it takes to go toe-to-toe with the Subaru WRXs, Mitsubishi EVOs and Audi Quattros that are the traditional weapons of choice in my beloved sport. 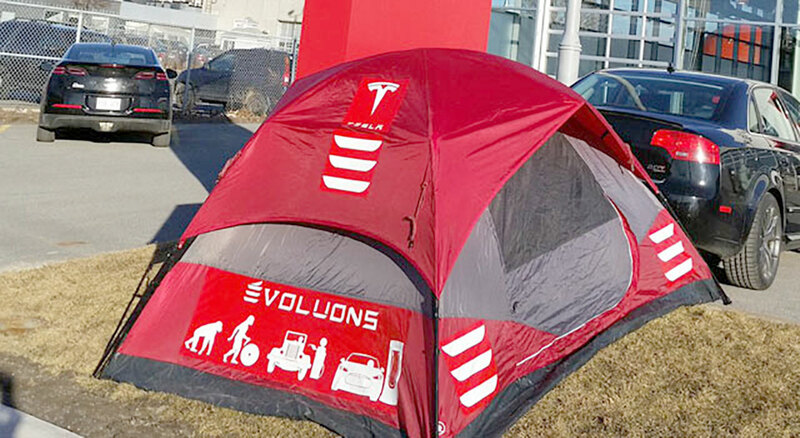 I was in fact so stoked at the prospect that I camped out two days in front of the Montreal Tesla Store to make sure I’d be first in line to reserve one. After a two and a half year wait, I was dying to see if I was right. I had been a loyal Audi driver for the last 20 years, having had a 90 Quattro 20V, an A3 3.2 Quattro and both B5 and B7 generations of the A4 Quattros. These cars, of course, are legends in the world of rallying and between the four of them they racked up more than a dozen podium finishes for me, mostly outright wins. 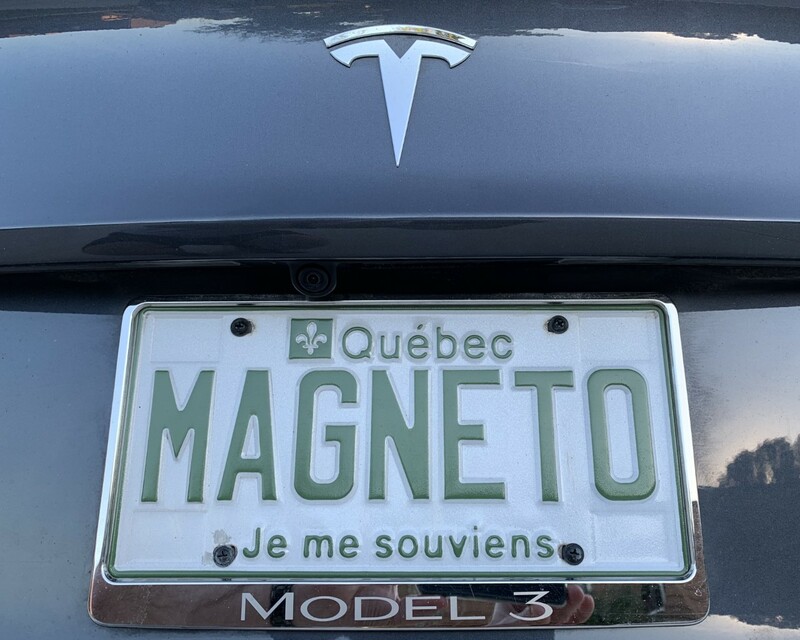 So there’s no question my expectations for my Performance Model 3 – named Magneto after the famous X-man with electromagnetic powers were set pretty high. Ian's Tesla Model 3 with the 'MAGNETO' number plate. Not only do I compete but I also enjoy organizing these events, and so it was that my first chance to try the car out in battle conditions would be while scouting route as the organizer of the first event on the 2019 Quebec winter schedule, the Rallye Des Neiges. So how was that first outing? In a word, SPECTACULAR — especially once you put it in Track Mode. I’ve never had such laser-pinpoint precise control of a car’s attitude and trajectory just by modulating the accelerator. After just a short time of acclimating to the one-foot style, it becomes so natural and confidence inspiring to transfer the car’s weight and attitude back and forth with just a press or lift of your right toes. And even though Track Mode lets you drift the car in big lurid power slides it never completely stops monitoring things, if it detects the car is going to go too far it will gently intervene to clean up your line. The deftness with which it does that is amazing; it’s so subtle you really need to pay attention sometimes to notice when it’s stepping in. I was really hoping to get some good in car footage from the rally last night but my new camera mount sits way too high. Epic fail as you will see in this excerpt 😟. The real challenge of course came on the Big Night, as an organizer I can choose my own role for the event and I almost never fail to go with Course Opening Car duties. This job involves leaving the start about 15 minutes ahead of the first competitor and running the entire route to ensure that all the roads are open and safe as well as see that all the checkpoint cars are in their correct locations with the correct synchronized clocks, etc. This also means that one generally has to go FASTER than the competitors, lest they catch up or overtake me! 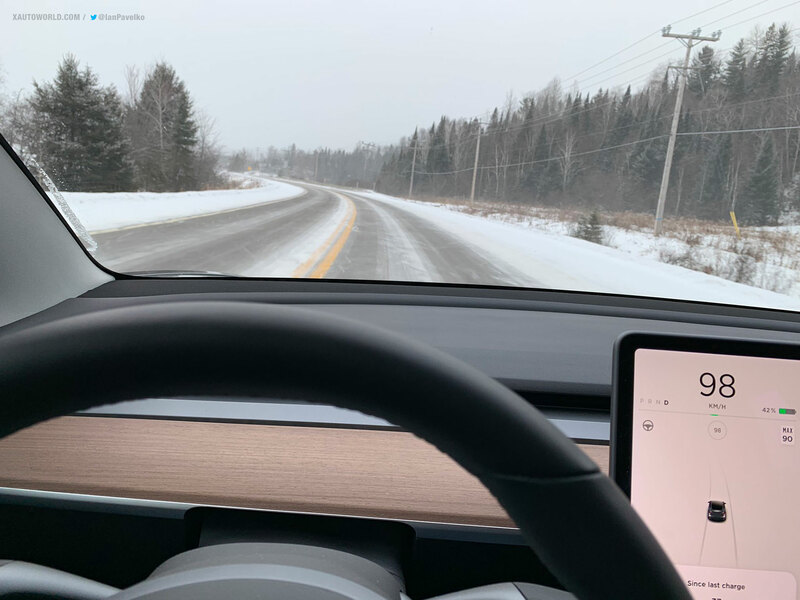 The Model 3 Performance proved vastly up to the task, staying well ahead of schedule the whole night. The only real hitch was the temperature. After having run the route several times during the layout and checking phases in 0℃/32℉ to -10℃/+14℉ weather I was able to determine that the max range at those temps while running at rally speeds and conditions would be around 150 miles or 250 kilometers. So I simply engineered the route to stay within that distance. 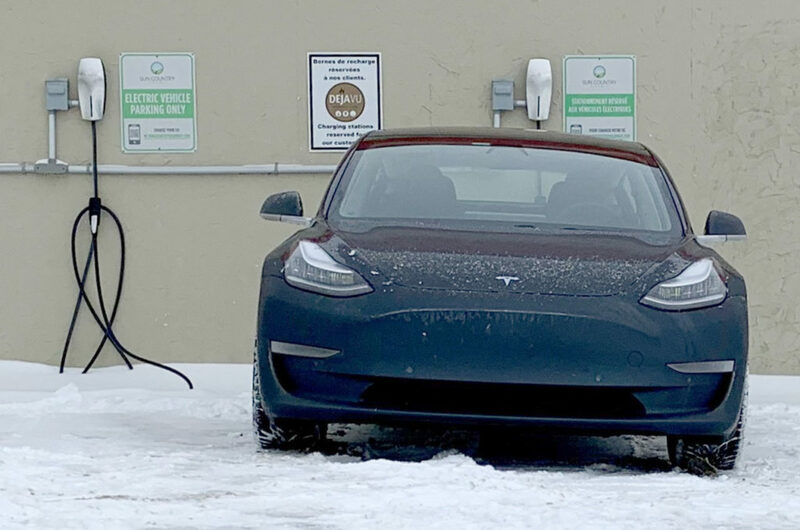 I also was fortunate to find a restaurant in our start and finish location of Hawkesbury Ontario, Déjà Vu, that had two 40 amp Tesla Destination Chargers so I could also be assured of leaving on a full battery and not having to worry about where to refill if I came back really low. 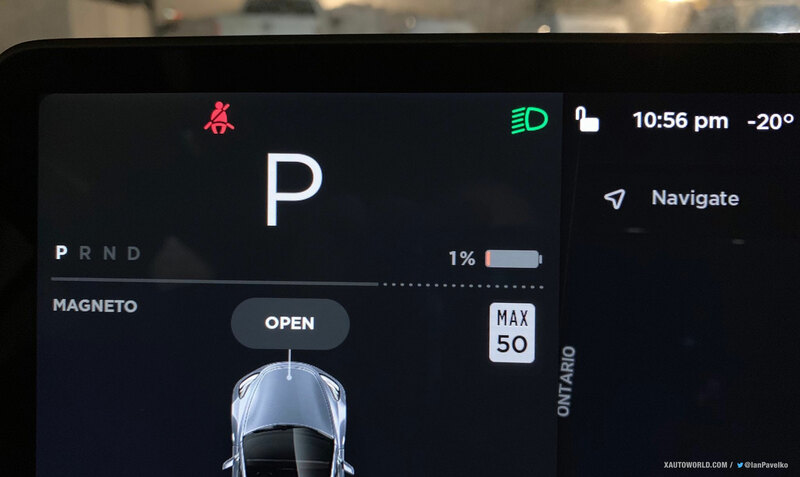 As the end approached I eyed the battery and consumption graphs with vigilance, predicting we’d hit the finish with something like 1% to 2% charge remaining. My navigator Dave and his daughter Sabrina, who was in the back seat handling communications with the checkpoint and recovery car crews, grew increasingly silent. 18%. 15%. 12%… it kept counting down as the temps dropped and the snow intensified. We began the last 22 kilometer/14 mile section to the finish with a lonely 8% showing. Time for some Faith In Science. As we approached the outskirts of the town we hit 3%. Over the tall bridge crossing the Ottawa river into the town center we hit 2%. And as we rolled into our parking spot at the restaurant… 1%. Even after now having owned it for four months it still strikes me as amazing that this even car exists. Tesla’s stated mission is to accelerate the world’s transition to sustainable energy and transport. 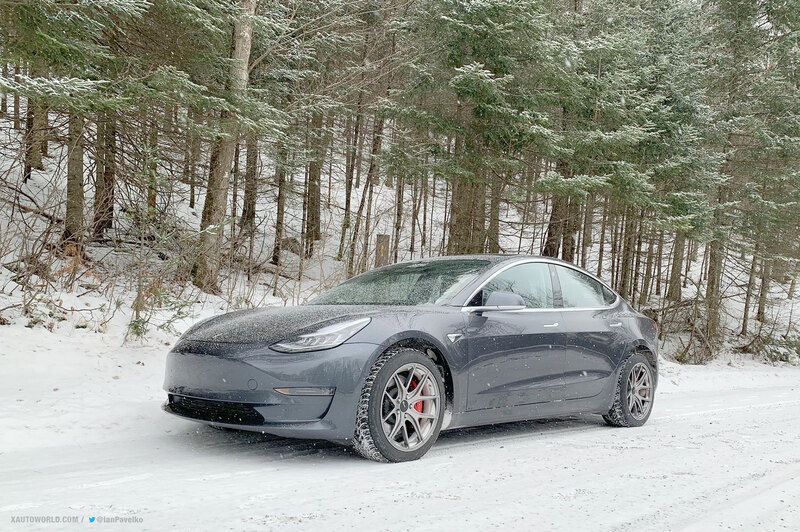 For Model 3 to meet that criteria all they really needed to do was make an attractive, comfortable, reliable electrically powered sedan that would prove competitive with other such cars. But they went so way, way beyond that. They built something that even the most jaded gearhead would adore. Even one who insisted that his everyday sedan be able to take on the world’s best street-legal rally cars in the dead of winter. It’s clear that Tesla understands that to win the race against climate change, to win over both hearts and minds of even the most skeptical consumer, you can’t just build something that gets the job done. You have to build something the customer couldn’t possibly imagine. For me, a car that has this level of performance and capability that costs but $6 to fill up on renewable hydro energy wasn’t just unimaginable it was, to borrow a phrase from Arthur C. Clark, a feat of technology so sufficiently advanced as to be indistinguishable from magic. Note: For more information on Navigational Rallying in Quebec, check out Club Autosport La Licorne’s Facebook page (in French). About the Author: Ian Pavelko is a true Tesla enthusiast who literally spent two cold nights outside the Tesla Store to get his Model 3 reservation back in Mar 2016, he got his dream car delivered last year, a Model 3 Performance in Midnight Silver Metallic. Tesla enthusiast and proud owner of a Model 3 Performance in Midnight Silver Metallic (gray)! This is your car on #Trackmode.